Get ready for another Mortal Kombat 9 combo by Skynet516. Watch Kratos produce 73-percent damage midscreen inside. 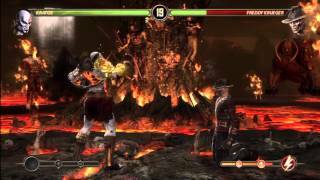 Skynet516 has been making Mortal Kombat 9 combo videos all week. For this one, he shows off Kratos' 73-percent damage from midscreen.